July 26, 2013, 9 a.m.
Two journalism professors suggest approaches for training a new generation of journalists for the data-heavy work ahead of them. By Amy Schmitz Weiss & Cindy Royal July 26, 2013, 9 a.m.
Editor’s note: Two journalism educators — Amy Schmitz Weiss of San Diego State and Cindy Royal of Texas State — have provided their own lenses on how journalism education might be reshaped to match the current media landscape students are graduating into. Specifically, journalism and mass communication programs are at a fork in the road — they can either sit back and watch or take an active role in transforming how our students can enter a new, digital-savvy competitive workforce. Are the students we are training in our classrooms ready to take on the workplace they enter in tomorrow? When we consider that two years ago, specific digital roles and responsibilities in the workplace that are common today, didn’t exist before — we are at a crucial moment where journalism and mass communication programs must be thinking 10 steps ahead of the rest. Journalism and mass communication programs as well as computer science and engineering departments represent a new realm of collaboration. What are the potential connections between journalism and mass communication and computer science programs? We share a focus on how to display and communicate information albeit differently. When we consider the mass communication landscape today, digital media is becoming pervasive and necessary for any aspect of communicating and disseminating information. When we consider computer science today, computer programming languages, frameworks and other applications are being driven by new technological advancements in society but also by the increasingly important role of data science and Big Data in society today. We can see that new scripts and programming languages are being developed to help understand how data can be organized, curated, segmented, and analyzed in a variety of ways. The potential for these two areas to come together is not fantasy but a reality. As future careers in these two areas continue to evolve, it will be not likely but necessary that computer scientists understand digital media technologies that drive the kind of work they do and that journalists and media practitioners understand Big Data and data science as they embark on issues important to the publics and audiences they serve wherein data will play a major role. In my own personal experience, I was fortunate to have the chance to bring together journalism and computer science students in spring 2012 to create a mobile news app for our campus called AzteCast. The class was co-taught by my colleague from computer science, Joseph Lewis and me. We received an AEJMC Bridge Grant from the John S. and James L. Knight Foundation to be able to offer the class and launch the mobile news app within six months. The students learned so much from each other during the semester. It opened their eyes to learning more about each others’ fields and how closely integrated they are. The mobile app is now a year old and continues to have much success on our campus with our student population. Since then, I have collaborated with other colleagues in our College of Sciences at our university to launch Digital Ninja Workshops with journalism and science students from other disciplines outside of computer science but in other areas such as geology. My own steps to do the mobile app class and Digital Ninja workshops show that collaboration can happen for our students in formal and informal learning environments, it’s up to the educator to take the opportunity by the reins. Recently, the School of Journalism at the University of Texas at Austin also embarked on a similar collaborative experience in which they brought together journalism and computer science students for a semester for a mobile app course taught by Robert Quigley. The course was quite successful with about five mobile apps created by the students by the end of the semester. Understand the nuances of digital media technologies. Know how to communicate and disseminate information across a variety of digital platforms. Understand how to curate and filter the information. Know how to program information into effective and powerful applications, digital interfaces or digital frameworks. Know how to make the presentation of this information clear, accurate, free of complication, and aesthetically pleasing. Know the appropriate programming languages that will suit the information on hand and how to make it accessible, searchable and digestible for a variety of digital platforms. Understand how data can be arranged, curated, segmented and analyzed within the context of existent information. We don’t have to wait for these Digital Media Data Gurus to come to us. As educators in higher education, we have the opportunity to help our students aim for this kind of skill set whether or not they realize these skills will prove valuable to them when they enter their chosen field. How can this be done? Here are a few ideas of how you can create learning experiences at your own institution toward this effort. Taking small steps toward informal and formal educational opportunities is one way to start and build this unique initiative at your own institution over time. 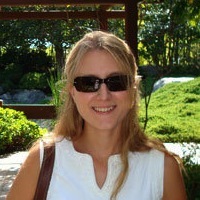 Amy Schmitz Weiss is an associate professor in the School of Journalism and Media Studies at San Diego State University. Schmitz Weiss is a 2011 Dart Academic Fellow and has a PhD in journalism from the University of Texas at Austin. She teaches journalism courses in basic writing and editing, multimedia, web design, data journalism, and mobile journalism. Beyond these collaborations that Dr. Schmitz-Weiss describes, questions remain. How much of this competency should ultimately be adopted by journalism and mass communication programs? Is it useful to continue to consider these as discrete disciplines? Or is it possible to develop an educational program that addresses the advanced concepts and skills needed for the future of media? There are many reasons why communication programs cannot simply rely on computer science to do the heavy lifting when it comes to programming and data education for communicators. Journalism is a specialized use of many other fields. We teach photojournalism in ways that are different than those taught in photography departments in art schools and video journalism differently than the methods used in film school. Language itself is taught in dedicated programs. But in English-speaking countries, English departments at universities have different goals for teaching language, ranging from appreciation of literature to creative writing to literary theory and research. While concepts overlap, the applied nature of journalism has specific tenets that most programs would not leave to an English department to address. This model provides a strong metaphor for the journalism-computer science relationship. The mission of computer science programs can range from artificial intelligence to robotics to scientific computing in the fields of chemistry, physics and health. While general concepts may be relevant, the applied nature of technology in communication requires more specific and focused learning. Computer science does not equal web development. The specific application of Web and mobile development is merely a subset of the computer science discipline, and not often considered a priority. But for communication technology, these delivery platforms are in the forefront. The rise of Web development schools demonstrates a market with a need to be filled. Programs like Starter League in Chicago, Flatiron School in New York and MakerSquare in Austin are popping up around the country to provide concentrated, in-depth Web development training over 8-12 weeks. This is a need that is not being directly filled by computer science programs. Design is a key element in the ability to communicate effectively. 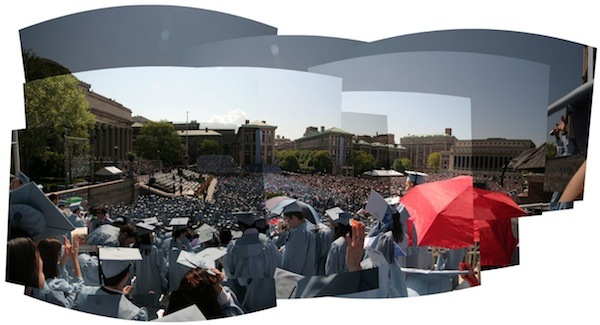 Design is another area that is taught in other departments, but journalism schools have long coopted for their own purposes for tasks like page layout and graphics. While computer science programs have not been traditionally focused on design concepts, many journalism and mass communication programs have been teaching Web design courses for years. Web development is a natural extension of this competency and can be used as the foundation for more advanced programming and data concepts. Knowledge of statistics is as important to the use of data as computer science. Many journalism programs have a math or statistics requirement that students must take. It is the rare program that offers its own “Math for Journalists” course. If statistics lessons are not focused on communication applications, the benefits of the course are lost. Statistics need to be integrated into exercises that are focused on storytelling and informing the public. This can serve as an introduction to and extension of more advanced data concepts. 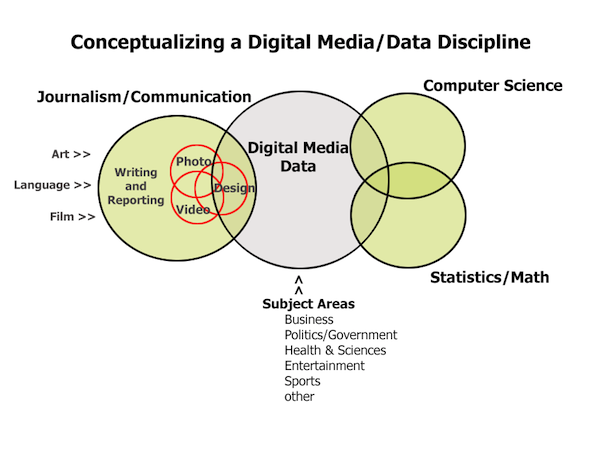 This image conceptualizes a Digital Media/Data discipline in which elements already existing in journalism, like language, graphic design and multimedia, are combined with technology and math skills and are influenced by subject areas and specializations. Language and visual skills have been readily coopted by communication programs in the past, but technology and math skills have not, leaving the discipline with graduates who are less prepared to integrate these topics into their working environment. The gap represented by the gray circle represents the opportunity for programs to integrate Web development and data skills within a communications context. Need for different teaching methods and approaches. Because we have different goals and applications, journalism programs will need to implement different methods of teaching than computer science programs. Students entering journalism programs may not have had the same preparation or expectation for coding as those who enter a computer science program. Thus, programming courses developed for journalists will need to have a specific context and level of support than those offered in computer science. In addition, collaborations with professional news organizations practicing data journalism will flow more naturally from a media-focused program. Rise of learn-to-code movement. Over the past year, many articles have been written on the importance of learning to code — children should learn to code, women should learn to code, everyone should earn to code. Sites like CodeAcademy and Khan Academy provide free and easy-to-use tutorials on the basics of coding. But students need help in applying these skills to journalism problems. The time is right to integrate these concepts directly into journalism curricula by providing the proper context and learning experiences. Opportunity to develop technology skills in different audiences. Journalism programs provide a unique opportunity to develop technology skills in groups who have been traditionally underrepresented in computer science. With the percentage of females in mass communication programs at 60 to 70 percent, we can reach women — as well as others who may not have been interested in a traditional computer science path — by offering relevant and supportive technology instruction. Approaches in computer science departments to include more women have not been successful. A different mindset will be instrumental to our ability to develop these competencies in a broad base of our population. The following skills will be necessary to integrate into a digital media curriculum, whether through focused collaborations with other departments or in-house competency development. These are not necessarily individual courses, but can be integrated into the curriculum via existing or new courses, through required or elective courses and could provide the basis for new sequences or majors. This approach is not without challenges. While language and visual literacy were natural integrations, most journalists, journalism students and faculty are completely unfamiliar with coding. Finding educators who are trained and willing to experiment and stay up-to-date with the fast pace of technological change will be critical to the success of any program. I have experimented with data projects and mobile design in my courses through the support of AEJMC/Knight Foundation Bridge Grants, and each experience required significant learning and preparation. But the outcomes of each were valuable to students, and the skills I gained are an investment in our ability to expand curriculum in the future. For more programs to participate in these activities, they will have to consider faculty with different skill sets in their hiring and tenure practices. Changes to curriculum always meet with challenges in programs that are already packed with requirements and accreditation standards. These standards, however, will need to be modified to reflect the needs of the discipline now and in the future. And technology curriculum without relevance to storytelling and information sharing will only serve to confuse and frustrate students who are forced to make those connections on their own. We need to build on the foundation of skills most programs are already teaching, like Web design and multimedia, and push forward to update curriculum with the advanced topics the industry is going to need. Does your school introduce these concepts in the communication curriculum? Do you think it should? If these are the skills necessary to communicate and tell stories in the future, we need to consider both the competencies that we need to develop within our programs and how we might collaborate in meaningful ways with other disciplines. Cindy Royal is an associate professor in the School of Journalism and Mass Communication at Texas State University in San Marcos. She completed Ph.D. studies in journalism and mass communication at the University of Texas in 2005. At UT, she focused on the effects of the Internet on communication and culture. She will be a 2013-2014 Knight Fellow at Stanford University. POSTED July 26, 2013, 9 a.m.
Weiss & Cindy Royal, Amy Schmitz. "At the intersection of journalism, data science, and digital media: How can j-schools prep students for the world they’re headed into?." Nieman Journalism Lab. Nieman Foundation for Journalism at Harvard, 26 Jul. 2013. Web. 19 Apr. 2019. Weiss & Cindy Royal, Amy Schmitz. "At the intersection of journalism, data science, and digital media: How can j-schools prep students for the world they’re headed into?." Nieman Journalism Lab. Last modified July 26, 2013. Accessed April 19, 2019. https://www.niemanlab.org/2013/07/at-the-intersection-of-journalism-data-science-and-digital-media-how-can-j-schools-prep-students-for-the-world-theyre-headed-into/. | title = At the intersection of journalism, data science, and digital media: How can j-schools prep students for the world they’re headed into?